Step 1: grab coloured card stock. I went with bright and cheerful yellow. Fold into card size you want. Step 2: run through die cutting machine with a scalloped frame die, just off the top of the card so it doesn't chop it in half. Step 3: Stamp one of the gorgeous flower stamps from Kennedy Grace Creations in the middle. I went with Beautiful Bloom-Sweet Rose and stamped it in black to make the contrast as big as possible. Step 4: Die cut a frame of black (or other colour if you fancy it) card stock and add around the flower to frame it prettily. Step 5: Add sentiment. 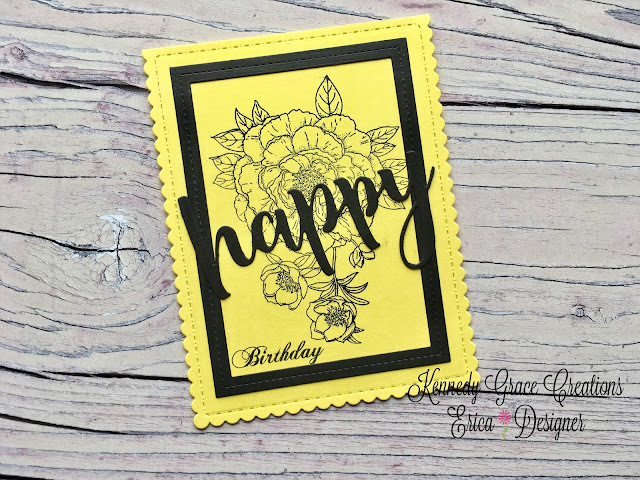 I used a die cut word and stamped another one to make it say 'Happy Birthday'. Again, I used black to keep it simple but elegant. Step 6: Add embellishments if you feel it needs it. I decided against it to challenge myself to make a clean and simple card, something that isn't really my forte. Step 7: Write your greeting and post it! Done!! Phew, is anyone else sweaty? I sometimes get so excited about crafting my heart races. Surely that counts as cardio then?? Happy crafting from Erica and see you on the other side in a few weeks! Beautiful card Erica. Love this idea.